As being both an anime / manga fan and a student of Japanese language and culture, I have been exposed to quite a lot of Japanese-related events and activities around the New York area through out the years. From the various conventions, to the “Japan Day” celebration in Central Park, to the various festivals thrown by my college’s Japanese culture club, I have gotten my fair share of culture. 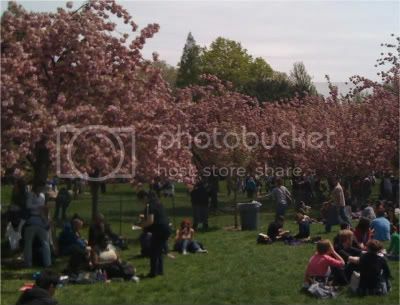 But I have never been to the annual Sakura Matsuri festival held every year at the Brooklyn Botanical Garden, nor was I really planning on going this year. It looked like it would be filled with the same activities I have seen day-in and day-out. Taiko Drumming, Kimono wearing, origami… I got it already. But this year seemed to include a lot of otaku-related activities thanks to the involvement of Peter Tatara and the New York Anime Festival. Add that to the fact that a few of my friends and my favorite local bunny girl were attending, and so I ended up making the last-minute decision to go to Brooklyn last Saturday. … and very much to my surprise, Sakura Matsuri ended up being one of the most enjoyable Japanese culture event I have ever been to. 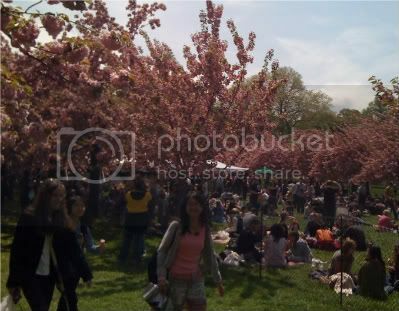 I would say that the key factor that made Matsuri stand out was the beauty of the cherry blossoms, and being able to enjoy them like some cheesy scene in a Japanese romance film. The weather had called for intense rain on that day, but lucky for me, the rain clouds parted when I arrived just past noon, and the nice spring weather stayed through out the rest of the afternoon. I didn’t have to worry about bringing an umbrella for the festival, I should have brought the sunblock! 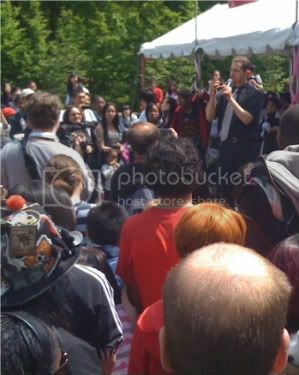 I was also delighted to find that unlike what other ani-bloggers may have lead me to believe, Sakura Matsuri was not an impromptu anime convention. The majority of the festival’s attendance went to families, so while there were some cosplaying going on, it wasn’t all too prominent. All the otaku realized that they were in a public place, so they generally behaved themselves. I found myself more annoyed over the crying babies in attendance than hyperactive teenagers. It was a very chilled atmosphere, and I found this to be a very welcomed change from the usual chaos of a convention. The NYAF-sponsored anime events took place in their own little section of the garden with its own stage and booths. I got to chat a little with Peter and Ali Kokmen of Del Rey manga, who was sporting a festive yellow bow tie for the occasion. The stage performer I was very interested in seeing was Uncle Yo, a local comedian and writer for the blog Ani-Gamers. I had met Yo while covering a panel for NYAF last year, but little did I know about his celebrity status among the local otaku. Whenever he preforms his geek comedy act on stage, a huge crowd of otaku watches and laughs hysterically at his jokes. The dude puts on a good show, and later in the day, he sat down with Samurai Beat Radio for an interview about American otaku culture. The main stage was where the traditional and headline performances took place, and thanks to my friend Victoria of Purple Sky Magazine, I was able to get press access to the final performances of the day. An excellent opportunity to play with my new Flip Ultra camcorder, and the Samurai Sward Soul presentation was a truly awesome show to be able to watch up close like this. The first j-pop artist may have had the cute-as-a-button looks down, but her music seem to be as non-j-pop as possible. Minami Kizuki came out with a shamisen, an ancient Japanese guitar, and the vocal talent that instantly conjured up all the traditional images from the land of the raising sun. A very melodic and beautiful performance from a very talented girl. And finally, the headliner for the event was Ai Kawashima, a j-pop singer best known for her hard life growing up and her current philanthropic work in Africa. Ai seemed a little out of it for her performance, and I later heard reports of her coming down with a cold that weekend. But still, it was nice to see a j-pop artist with enough talent to play her own background music, and her very positive lyrics seemed to mirror her good nature reputation. Out of all the J-culture events I have ever been, Sakura Matsuri had to have been one of the best. An absolutely beautiful spring day with some fantastic scenery, great live musical performances, and just a little hint of geekery. Calm and relaxing, it was truly a nice day in the park. This entry was posted on Wednesday, May 6th, 2009 at 8:22 pm by Scott	.